Blueberries and cranberries have become increasingly popular in recent years because they are rich in vitamins and anti-oxidants believed to have considerable health benefits. As a consequence, in the span of a few years they have emerged from relative obscurity in the UK to becoming some of the most popular garden fruit plants. They are very hardy, trouble free plants which can be grown successfully in all parts of UK as long as they are provided with the right soil conditions. Click here for a guide to choosing blueberry and cranberry. The cultivated blueberries are from a group known as high bush blueberries, a type originating in North America. These form fairly upright bushes growing up to 1.5m/5ft or more in height and spread. 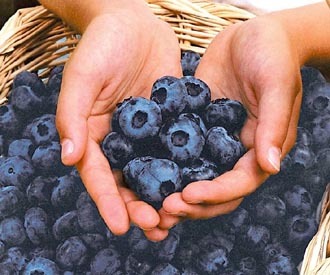 The large dark blue berries are sweet and rich in vitamins and anti-oxidants. In addition to their fruit, they also have ornamental value. Their spectacular red autumn foliage adds colour to the garden. The blossom, which opens in May is usually white but may be pale pink in some varieties. They are easy to grow as long as they are provided with right growing conditions. 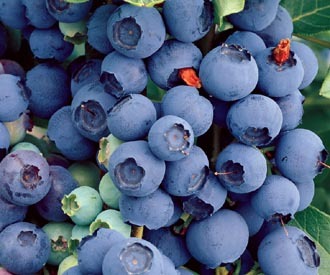 Blueberries are acid-loving plants native of regions with moist peaty soils. To grow them successfully you need a constantly moist, acid soil of pH 5.5 or lower with plenty of organic matter. Ideally you should water them with rainwater as tap water is hard in most parts of the country and would reduce acidity. If your garden soil is not suitable they can be grown in containers using an ericaceous (acid) compost and rainwater. 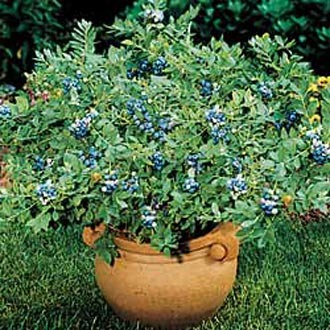 All the blueberry plants we supply are container grown. 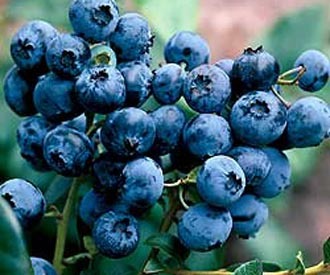 The most widely grown mid season blueberry producing heavy crops of large berries with a slightly tart flavour. Excellent bronze autumn colour. Like blueberries, cultivated cranberries are also from a species originating in North America. Cranberries plants are evergreen with small silvery leaves which turn bronze or red in the autumn, and branches that spread on the ground. They can root from branches touching the soil. As such they are ideal as ground-cover plants. They have tiny pink flowers and red berries which are rich in vitamins and anti-oxidants. They are acid-loving plants native of regions with moist and even boggy soils rich in organic matter. They are easy to grow as long as they are provided with right growing conditions. To grow them successfully you need a constantly moist, very acid soil of pH 4 with plenty of organic matter. Ideally you should water them with rainwater as tap water is hard in most parts of the country and would reduce acidity. If your garden soil is not suitable they can be grown in containers using an ericaceous (acid) compost and rainwater. The cranberry plants we supply are container grown.